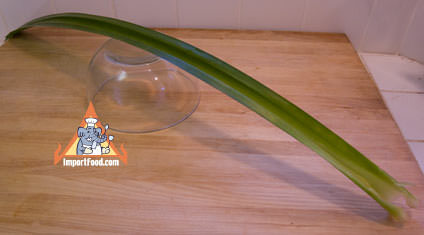 The long (about 26"), fragrant pandan leaves are grown in Hawaii. Recently we featured a fantastic recipe for chicken wrapped in pandan leaves, with step by step instructions. Also see: Khanom Chan recipe using pandan leaves. Pandan has a wonderful, distinctive, mysterious and addictive scent, compared to vanilla. Pandan leaves are used to make desserts, also to add flavor and scent to jasmine rice. Just put a few 6" pieces into the rice cooker. A secret ingredient that makes people come back for more. See our video on traditional Thai rice cooked with pandan. We also offer pandan paste. We ship fresh pandan leaves via Priority Mail, quick delivery within 2-3 days straight to your mailbox. Please Note: Fresh pandan leaves ship via USPS Priority Mail so please provide an address that can be used for USPS delivery. If you order only fresh produce, select "$0.00" as shipping charge at checkout (because the price above includes express shipping). If you order fresh produce and any other items, you must checkout with "UPS Ground" as the shipping method, and you will receive the other items separately. Occasional delays due to Mother Nature & harvest conditions. Any questions about shipping, if you need a definite delivery date, delivery times, or anything else please feel free to call toll free 888-618-THAI. A very sweet treat you'll absolutely love. In Thailand some shops exist only to offer sticky rice with mango, in several variations.Visit this link to see Bangkok's most famous sticky rice w/mango vendor. Here we prepare two versions, a 'basic' style and a more fragrant, elegant version prepared with fresh pandan leaves.